Prince Edward Island (PEI or P.E.I. ; French: Île-du-Prince-Édouard) is a province of Canada consisting of the island of the same name, as well as several much smaller islands. Prince Edward Island is one of the three Maritime Provinces and is the smallest province in both land area and population. It is the only subnational jurisdiction of North America outside the Caribbean to have no mainland territory, and the only such jurisdiction to have no land boundary. The island has several informal names: "Garden of the Gulf," referring to the pastoral scenery and lush agricultural lands throughout the province; and "Birthplace of Confederation" or "Cradle of Confederation", referring to the Charlottetown Conference in 1864, although PEI did not join Confederation until 1873, when it became the seventh Canadian province. The backbone of the economy is farming; it produces 25% of Canada's potatoes. Historically, PEI is one of Canada's older settlements and demographically still reflects older immigration to the country, with Celtic, Anglo-Saxon and French surnames being dominant to this day. According to the 2016 census, the province of Prince Edward Island has 142,907 residents. It is located about 200 kilometres (120 miles) north of Halifax, Nova Scotia and 600 kilometres (370 miles) east of Quebec City. It consists of the main island and 231 minor islands. Altogether, the entire province has a land area of 5,686.03 km2 (2,195.39 sq mi). Its capital is Charlottetown. The main island is 5,620 km2 (2,170 sq mi) in size, slightly larger than the U.S. state of Delaware. It is the 104th-largest island in the world and Canada's 23rd-largest island. In French, the island is called today Île-du-Prince-Édouard, but its former French name, from the time of New France until it was rebaptized by the British in 1798, was Île Saint-Jean (St. John's Island). The island is known in Scottish Gaelic as Eilean a' Phrionnsa (lit. "the Island of the Prince", the local form of the longer 'Eilean a' Phrionnsa Iomhair/Eideard') or Eilean Eòin for some Gaelic speakers in Nova Scotia though not on PEI (lit. "John's Island" in reference to the island's former name); in Míkmaq as Abegweit or Epekwitk roughly translated "land cradled in the waves". Prince Edward Island is located in the Gulf of St. Lawrence, west of Cape Breton Island, north of the Nova Scotia peninsula, and east of New Brunswick. Its southern shore bounds the Northumberland Strait. The island has two urban areas. The largest surrounds Charlottetown Harbour, situated centrally on the island's southern shore, and consists of the capital city Charlottetown, and suburban towns Cornwall and Stratford and a developing urban fringe. A much smaller urban area surrounds Summerside Harbour, situated on the southern shore 40 km (25 mi) west of Charlottetown Harbour, and consists primarily of the city of Summerside. As with all natural harbours on the island, Charlottetown and Summerside harbours are created by rias. The island's landscape is pastoral. 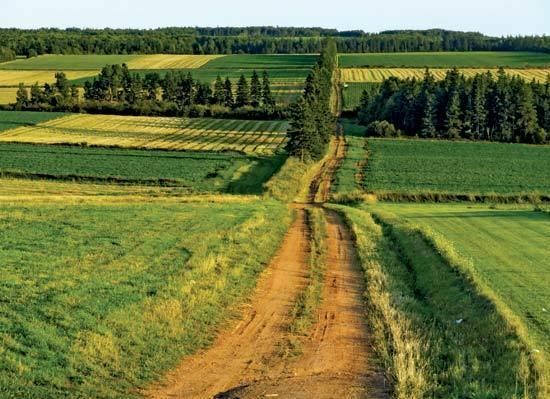 Rolling hills, woods, reddish white sand beaches, ocean coves and the famous red soil have given Prince Edward Island a reputation as a province of outstanding natural beauty. The provincial government has enacted laws to preserve the landscape through regulation, although there is a lack of consistent enforcement, and an absence of province-wide zoning and land-use planning. Under the Planning Act of the province, municipalities have the option to assume responsibility for land-use planning through the development and adoption of official plans and land use bylaws. Thirty-one municipalities have taken responsibility for planning. In areas where municipalities have not assumed responsibility for planning, the Province remains responsible for development control. The island's lush landscape has a strong bearing on its economy and culture. The author Lucy Maud Montgomery drew inspiration from the land during the late Victorian Era for the setting of her classic novel Anne of Green Gables (1908). Today, many of the same qualities that Montgomery and others found in the island are enjoyed by tourists who visit year-round. They enjoy a variety of leisure activities, including beaches, various golf courses, eco-tourism adventures, touring the countryside, and enjoying cultural events in local communities around the island. The smaller, rural communities as well as the towns and villages throughout the province, retain a slower-paced, old-world flavour. Prince Edward Island has become popular as a tourist destination for relaxation. The economy of most rural communities on the island is based on small-scale agriculture. Industrial farming has increased as businesses buy and consolidate older farm properties. The coastline has a combination of long beaches, dunes, red sandstone cliffs, salt water marshes, and numerous bays and harbours. The beaches, dunes and sandstone cliffs consist of sedimentary rock and other material with a high iron concentration, which oxidises upon exposure to the air. The geological properties of a white silica sand found at Basin Head are unique in the province; the sand grains cause a scrubbing noise as they rub against each other when walked on, and have been called the "singing sands". Large dune fields on the north shore can be found on barrier islands at the entrances to various bays and harbours. The magnificent sand dunes at Greenwich are of particular significance. The shifting, parabolic dune system is home to a variety of birds and rare plants; it is also a site of significant archeological interest. Despite Prince Edward Island's small size and reputation as a largely rural province, it is the most densely populated province in Canada. The climate of the island is considered to be moderate and strongly influenced by the surrounding seas. As such, it is milder than inland locations owing to the warm waters from the Gulf of St. Lawrence. The climate is characterized by changeable weather throughout the year; it has some of the most variable day-to-day weather in Canada, in which specific weather conditions seldom last for long. During July and August, the average daytime high in PEI is 23 °C (73 °F); however, the temperature can sometimes exceed 30 °C (86 °F) during these months. In the winter months of January and February, the average daytime high is −3.3 °C (26 °F). The Island receives an average yearly rainfall of 855 millimetres (33.7 in) and an average yearly snowfall of 285 centimetres (112 in). Winters are moderately cold and long but are milder than inland locations, with clashes of cold Arctic air and milder Atlantic air causing frequent temperature swings. The climate is considered to be more continental than oceanic since the Gulf of St. Lawrence freezes over, thus eliminating any moderation. The mean temperature is −7 °C (19 °F) in January. During the winter months, the island usually has many storms (which may produce rain as well as snow) and blizzards since during this time, storms originating from the North Atlantic or the Gulf of Mexico frequently pass through. Springtime temperatures typically remain cool until the sea ice has melted, usually in late April or early May. Summers are moderately warm, but rarely uncomfortable, with the daily maximum temperature only occasionally reaching as high as 30 °C (86 °F). Autumn is a pleasant season, as the moderating Gulf waters delay the onset of frost, although storm activity increases compared to the summer. There is ample precipitation throughout the year, although it is heaviest in the late autumn, early winter and mid spring. Between 250 and 300 million years ago, freshwater streams flowing from ancient mountains brought silt, sand and gravel into what is now the Gulf of St. Lawrence. These sediments accumulated to form a sedimentary basin, and make up the island's bedrock. When Pleistocene glaciers receded about 15,000 years ago, glacial debris such as till were left behind to cover most of the area that would become the island. This area was connected to the mainland by a strip of land, but when ocean levels rose as the glaciers melted this land strip was flooded, forming the island. As the land rebounded from the weight of the ice, the island rose up to elevate it further from the surrounding water. 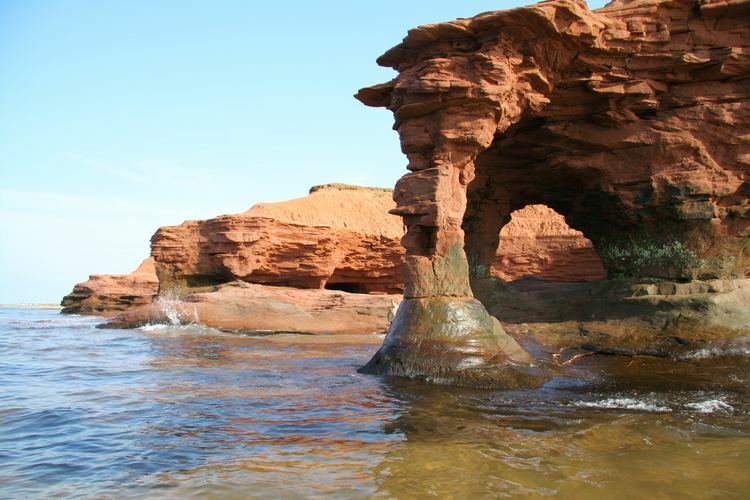 Most of the bedrock in Prince Edward Island is composed of red sandstone, part of the Permian aged Pictou Group. Although commercial deposits of minerals have not been found, exploration in the 1940s for natural gas beneath the northeastern end of the province resulted in the discovery of an undisclosed quantity of gas. The Island was reported by government to have only 0.08 tcf of "technically recoverable" natural gas. Twenty exploration wells for hydrocarbon resources have been drilled on Prince Edward Island and offshore. The first reported well was Hillsborough No.#1, drilled in Charlottetown Harbour in 1944 (the world’s first offshore well), and the most recent was New Harmony No.#1 in 2007. Since the resurgence of exploration in the mid-1990s, all wells that have shown promising gas deposits have been stimulated through hydraulic fracture or “fracking”. All oil and natural gas exploration and exploitation activities on the Island are governed by the Oil and Natural Gas Act R.S.P.E.I. 1988, Cap. 0-5 and its associated regulations and orders. The Province of Prince Edward Island is completely dependent on groundwater for its source of drinking water. As groundwater flows through an aquifer it is naturally filtered. The water for City of Charlottetown is extracted from thirteen wells in three wellfields and distributed to customers. The water removed is replenished by precipitation. Infrastructure in Charlottetown that was installed in 1888 is still in existence. With the age of the system in the older part of Charlottetown, concern has been raised regarding lead pipes. The Utility has been working with its residents on a lead replacement program. A plebiscite in 1967 was held in Charlottetown over fluoridation, and residents voted in favour. Under provincial legislation, the Utility is required to report to its residents on an annual basis. It is also required to do regular sampling of the water and an overview is included in each annual report. The Winter River watershed provides about 92 per cent of the 18 million litre water supply for the city of Charlottetown, which had difficulty in each of 2011, 2012 and 2013 with its supply, until water meters were installed. Minister of Communities, Land and Environment Robert Mitchell tabled a discussion paper on the proposed Water Act for the province on 8 July 2015. The use of groundwater came under scrutiny as the potato industry, which accounts for $1 billion every year and 50% of farm receipts, has pressed the government to lift a moratorium on high-capacity water wells for irrigation. The release of the discussion paper was to set off a consultation process in the autumn of 2015. Detailed information about the quality of drinking water in PEI communities and watersheds can be found at the Department of Environment, Labour and Justice. It provides a summary of the ongoing testing of drinking water done by the Prince Edward Island Analytical Laboratories. Average drinking water quality results are available, and information on the following parameters are provided: alkalinity, cadmium, calcium, chloride, chromium, iron, magnesium, manganese, nickel, nitrate, pH, phosphorus, potassium, sodium, and sulfate, as well as the presence of pesticides. Water testing services are provided for a variety of clients through the PEI Analytical Laboratories, which assesses according to the recommendations of the Guidelines for Canadian Drinking Water Quality published by Health Canada. Prince Edward Island used to have native moose, bear, caribou, wolf, and other larger species. Due to hunting and habitat disruption these species are no longer found on the island. Some species common to P.E.I. are red foxes, coyote, blue jays, and robins. Skunks and raccoons are common non-native species. Species at risk in P.E.I. include piping plovers, american eel, bobolinks, little brown bat, and beach pinweed. Some species are unique to P.E.I..In 2008, a new ascomycete species, Jahnula apiospora (Jahnulales, Dothideomycetes), was collected from submerged wood in a freshwater creek on Prince Edward Island, Canada. North Atlantic right whales, one of the rarest whale species, were once thought to be rare visitors into St. Lawrence regions until 1994, have been showing dramatic increases (annual concentrations were discovered off Percé in 1995 and gradual increases across the regions since in 1998), and since in 2014, notable numbers of whales have been recorded around Cape Breton to Prince Edward Island as 35 to 40 whales were seen in these areas in 2015. Since before the influx of Europeans, the Mi'kmaq</ref? First Nations have inhabited Prince Edward Island as part of the region of Mi'kma'ki. They named the Island Epekwitk, meaning "cradled on the waves"; Europeans represented the pronunciation as Abegweit. The natives believed that the island was formed by the Great Spirit placing on the Blue Waters some dark red crescent-shaped clay. There are two Mi'kmaq First Nation communities on Epekwitk today. In 1534, Jacques Cartier was the first European to see the island. In 1604, France claimed the lands of the Maritimes, including Prince Edward Island, establishing the French colony of Acadia. The island was named Île Saint-Jean by the French. The Mi'kmaq never recognized the claim but welcomed the French as trading partners and allies. After the Siege of Louisbourg (1745) during the War of the Austrian Succession, the New Englanders also captured Île Saint-Jean (Prince Edward Island). An English detachment landed at Port-la-Joye. Under the command of Joseph de Pont Duvivier, the French had a garrison of 20 French troops at Port-la-Joye. The troops fled and New Englanders burned the capital to the ground. Duvivier and the twenty men retreated up the Northeast River (Hillsborough River), pursued by the New Englanders until the French troops received reinforcements from the Acadian militia and the Mi'kmaq. The French troops and their allies were able to drive the New Englanders to their boats, nine New Englanders killed, wounded or made prisoner. The New Englanders took six Acadian hostages, who would be executed if the Acadians or Mi'kmaq rebelled against New England control. The New England troops left for Louisbourg. Duvivier and his 20 troops left for Quebec. After the fall of Louisbourg, the resident French population of Ile Royal were deported to France. The Acadians of Ile Saint-Jean lived under the threat of deportation for the remainder of the war. The New Englanders had a force of two war ships and 200 soldiers stationed at Port-La-Joye. To regain Acadia, Ramezay was sent from Quebec to the region to join forces with the Duc d'Anville Expedition. Upon arriving at Chignecto, he sent Boishebert to Ile Saint-Jean on a reconnaissance to assess the size of the New England force. After Boishebert returned, Ramezay sent Joseph-Michel Legardeur de Croisille et de Montesson along with over 500 men, 200 of whom were Mi'kmaq, to Port-La-Joye. In July 1746, the battle happened near York River. Montesson and his troops killed forty New Englanders and captured the rest. Montesson was commended for having distinguished himself in his first independent command. Roughly one thousand Acadians lived on the island, many of whom had fled to the island from mainland Nova Scotia during the first wave of the British-ordered expulsion in 1755, reaching a population of 5,000. However, many more were forcibly deported during the second wave of the expulsion after the Siege of Louisbourg (1758). In the Ile Saint-Jean Campaign (1758) General Jeffery Amherst ordered Colonel Andrew Rollo to capture the island. Many Acadians died in the expulsion en route to France; on December 13, 1758, the transport ship Duke William sank and 364 died. A day earlier the Violet sank and 280 died; several days later Ruby sank with 213 on board. Great Britain claimed the island in 1763, when France gave up its claim to the island. This was under the terms of the Treaty of Paris which settled the Seven Years' War. The British called their new colony St. John's Island (also the Island of St. John's). The high influx of Scottish Highlanders in the late 1700s resulted in P.E.I. having the highest provincial percentage of Scottish immigrants in Canada. (Not to underestimate the highest percentage of Scottish on neighbouring Cape Breton Island, however only being a part thereof the province of Nova Scotia.) This, in turn, led to a higher proportion of Scottish Gaelic speakers and thriving culture surviving on P.E.I. than Scotland itself, as the settlers avoided English influence overseas. Hence the formally existing Prince Edward Island Highland Regiment founded in 1875. The first British governor of St. John's Island, Walter Patterson, was appointed in 1769. Assuming office in 1770, he had a controversial career during which land title disputes and factional conflict slowed the initial attempts to populate and develop the island under a feudal system. In an attempt to attract settlers from Ireland, in one of his first acts (1770) Patterson led the island's colonial assembly to rename the island "New Ireland", but the British Government promptly vetoed this as exceeding the authority vested in the colonial government; only the Privy Council in London could change the name of a colony. In the mid-1760s, a survey team divided the Island into 67 lots. On July 1, 1767, these properties were allocated to supporters of King George III by means of a lottery. Ownership of the land remained in the hands of landlords in England, angering Island settlers who were unable to gain title to land on which they worked and lived. Significant rent charges (to absentee landlords) created further anger. The land had been given to the absentee landlords with a number of conditions attached regarding upkeep and settlement terms; many of these conditions were not satisfied. Islanders spent decades trying to convince the Crown to confiscate the lots, however the descendants of the original owners were generally well connected to the British government and refused to give up the land. In 1853, the Island government passed the Land Purchase Act which empowered them to purchase lands from those owners who were willing to sell, and then resell the land to settlers for low prices. This scheme collapsed when the Island ran short of money to continue with the purchases. 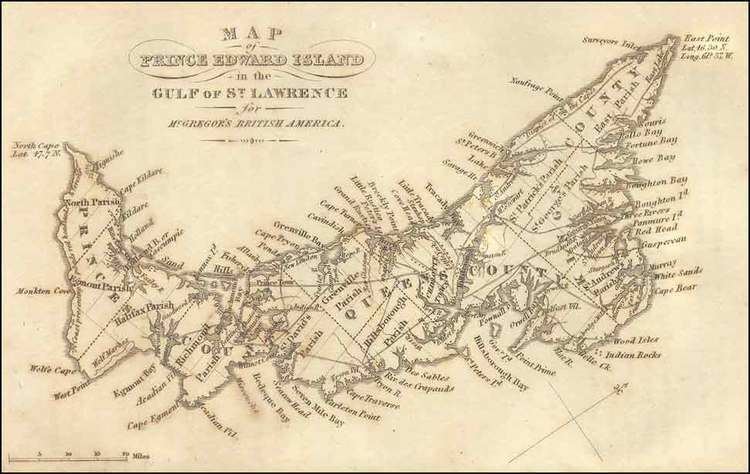 Many of these lands also were fertile, and were some of the key factors to sustaining Prince Edward Island's economy. During the American Revolutionary War Charlottetown was raided in 1775 by a pair of American-employed privateers. Two armed schooners, Franklin and Hancock, from Beverly, Massachusetts, made prisoner of the attorney-general at Charlottetown, on advice given them by some Pictou residents after they had taken eight fishing vessels in the Gut of Canso. During and after the American Revolutionary War, from 1776 to 1783, the colony's efforts to attract exiled Loyalist refugees from the rebellious American colonies met with some success. Walter Patterson's brother, John Patterson, one of the original grantees of land on the island, was a temporarily exiled Loyalist and led efforts to persuade others to come. The 1787 dismissal of Governor Patterson and his recall to London in 1789 dampened his brother's efforts, leading John to focus on his interests in the United States (one of John's sons, Commodore Daniel Patterson, became a noted United States Navy hero, and John's grandsons, Rear Admiral Thomas H. Patterson and Lt. Carlile Pioou). Edmund Fanning, also a Loyalist exiled by the Revolution, took over as the second governor, serving until 1804. His tenure was more successful than Patterson's. During the 19th century the colony of Prince Edward Island began to attract "adventurous Victorian families looking for elegance on the sea. Prince Edward Island became a fashionable retreat in the nineteenth century for British nobility." In September 1864, Prince Edward Island hosted the Charlottetown Conference, which was the first meeting in the process leading to the Quebec Resolutions and the creation of Canada in 1867. Prince Edward Island did not find the terms of union favourable and balked at joining in 1867, choosing to remain a colony of the United Kingdom. In the late 1860s, the colony examined various options, including the possibility of becoming a discrete dominion unto itself, as well as entertaining delegations from the United States, who were interested in Prince Edward Island joining the United States. In 1871, the colony began construction of a railway and, frustrated by Great Britain's Colonial Office, began negotiations with the United States. In 1873, Canadian Prime Minister Sir John A. Macdonald, anxious to thwart American expansionism and facing the distraction of the Pacific Scandal, negotiated for Prince Edward Island to join Canada. The Dominion Government of Canada assumed the colony's extensive railway debts and agreed to finance a buy-out of the last of the colony's absentee landlords to free the island of leasehold tenure and from any new immigrants entering the island (accomplished through the passage of the Land Purchase Act, 1875). Prince Edward Island entered Confederation on July 1, 1873. As a result of having hosted the inaugural meeting of Confederation, the Charlottetown Conference, Prince Edward Island presents itself as the "Birthplace of Confederation" and this is commemorated through several buildings, a ferry vessel, and the Confederation Bridge (constructed 1993 to 1997). The most prominent building in the province honouring this event is the Confederation Centre of the Arts, presented as a gift to Prince Edward Islanders by the 10 provincial governments and the Federal Government upon the centenary of the Charlottetown Conference, where it stands in Charlottetown as a national monument to the "Fathers of Confederation". The Centre is one of the 22 National Historic Sites of Canada located in Prince Edward Island. According to the 2011 National Household Survey, the largest ethnic group consists of people of Scottish descent (39.2%), followed by English (31.1%), Irish (30.4%), French (21.1%), German (5.2%), and Dutch (3.1%) descent. Prince Edward Island's population is largely white; there are few visible minorities. Chinese Canadians are the largest visible minority group of Prince Edward Island, comprising 1.3% of the province's population. Almost half of respondents identified their ethnicity as "Canadian." † Preliminary 2006 census estimate. Traditionally the population has been evenly divided between Catholic and Protestant affiliations. The 2001 census indicated number of adherents for the Roman Catholic Church with 63,240 (47%) and various Protestant churches with 57,805 (43%). This included the United Church of Canada with 26,570 (20%); the Presbyterian Church with 7,885 (6%) and the Anglican Church of Canada with 6,525 (5%); those with no religion were among the lowest of the provinces with 8,705 (6.5%). If one considers that the founders of the United Church of Canada were largely Presbyterians in Prince Edward Island, the Island has one of the highest percentages of Presbyterians in the country. The Island also has one of the largest number of Free Church of Scotland buildings in Canada, though attendance at many of these churches is very low today. The provincial economy is dominated by the seasonal industries of agriculture, tourism, and the fishery. The province is limited in terms of heavy industry and manufacturing, though the McCain's food conglomerate runs expansion operations from PEI. Agriculture remains the dominant industry in the provincial economy, as it has since colonial times. The Island has a total land area of 1.4 million acres (570,000 hectares) with approximately 594,000 acres (240,383 hectares) cleared for agricultural use. In 2006, the Census of Agriculture counted 1700 farms on the Island. During the 20th century, potatoes replaced mixed farming as the leading cash crop, accounting for one-third of provincial farm income. The number of acres under potato production in 2010 was 88,000, while soy accounted for 55,000. There are approximately 330 potato growers on PEI, with the grand majority of these being family farms, often with multiple generations working together. The province currently accounts for a third of Canada's total potato production, producing approximately 1.3 billion kilograms (1,400,000 short tons) annually. Comparatively, the state of Idaho produces approximately 6.2 billion kilograms (6,800,000 short tons) annually, with a population approximately 9.5 times greater. The province is a major producer of seed potatoes, exporting to more than twenty countries around the world. An estimated total of 70% of the land is cultivated and 25% of all potatoes grown in Canada originate from P.E.I. The processing of frozen fried potatoes, green vegetables, and berries is a leading business activity. As a legacy of the island's colonial history, the provincial government enforces extremely strict rules for non-resident land ownership, especially since the PEI Lands Protection Act of 1982. Residents and corporations are limited to maximum holdings of 400 and 1,200 hectares respectively. There are also restrictions on non-resident ownership of shorelines. The island's economy has grown significantly over the last decade in key areas of innovation. Aerospace, Bioscience, ICT and Renewable energy have been a focus for growth and diversification. Aerospace alone now accounts for over 25% of the province's international exports and is the island's fourth largest industry at $355 million in annual sales. The Bioscience industry employs over 1300 people and generates over $150 million in sales. Many of the province's coastal communities rely upon shellfish harvesting, particularly lobster fishing as well as oyster fishing and mussel farming. The sale of carbonated beverages such as beer and soft drinks in non-refillable containers, such as aluminum cans or plastic bottles, was banned in 1976 as an environmental measure in response to public concerns over litter. Beer and soft drink companies opted to use refillable glass bottles for their products which were redeemable at stores and bottle depots. Though often environmental and economic agendas may be at odds, the ‘ban the can’ legislation along with being environmentally driven, was also economically motivated as it protected jobs. Seaman's Beverages, a bottling company and carbonated beverage manufacturer, was established in 1939 and a major employer in Charlottetown, Prince Edward Island. Making it illegal to retail cans led to a bigger share of the carbonated beverage market for Seamans. Seamans Beverages was eventually acquired by Pepsi Bottling Group Inc in 2002 prior to the lifting of the legislation. The introduction of recycling programs for cans and plastic bottles in neighbouring provinces in recent years (also using a redemption system) has seen the provincial government introduce legislation to reverse this ban with the restriction lifted on May 3, 2008. Prince Edward Island has one of Canada's highest provincial retail sales tax rate at 9%. The tax is applied to almost all goods and services except some clothing, food and home heating fuel. The tax, along with the Federal Goods and Services Tax, is incorporated into the Harmonized Sales Tax in the province. The provincial government provides consumer protection in the form of regulation for certain items, ranging from apartment rent increases to petroleum products including gas, diesel, propane and heating oil. These are regulated through the Prince Edward Island Regulatory and Appeals Commission (IRAC). IRAC is authorized to limit the number of companies who are permitted to sell petroleum products. At present, approximately fifteen percent of electricity consumed on the island is generated from renewable energy (largely wind turbines); the provincial government has set renewable energy targets as high as 30-50% for electricity consumed by 2015. Until wind generation, the province relied entirely on electricity imports on a submarine cable from New Brunswick. A thermal oil-fired generating station in Charlottetown is also available. Electricity rates in the province were in 2011 the highest in Canada, at a domestic rate of 0.161 $/kWh. The province imports about 85 per cent of its power through New Brunswick. The maintenance shutdown of Point Lepreau nuclear plant forced the province to acquire most of its electrons on the expensive open market. The result was a steep price hikes of about 25 per cent in the three years to 2011 but the province later subsidised rates. Residents were to pay 11.2 per cent more for electricity when the harmonized sales tax was adopted in April 2013, according to the P.E.I. Energy Accord that was tabled in the legislature on 7 December 2012. and passed as the Electric Power (Energy Accord Continuation) Amendment Act, which establishes electric pricing from 1 April 2013 to 1 March 2016. Regulatory powers are derived for IRAC from the Electric Power Act. Since 1918 Maritime Electric has delivered electricity to customers on the Island. The utility is currently owned and operated by Fortis Inc. The average family income on Prince Edward Island is $62,110/year, and the minimum wage of $10.50/hour as of July 1, 2015. The provincial government is responsible for such areas as health and social services, education, economic development, labour legislation and civil law. These matters of government are carried out in the provincial capital, Charlottetown. Prince Edward Island is governed by a parliamentary government within the construct of constitutional monarchy; the monarchy in Prince Edward Island is the foundation of the executive, legislative, and judicial branches. The sovereign is Queen Elizabeth II, who also serves as head of state of 15 other Commonwealth countries, each of Canada's nine other provinces, and the Canadian federal realm, and resides predominantly in the United Kingdom. As such, the Queen's representative, the Lieutenant Governor of Prince Edward Island (presently Harry Frank Lewis), carries out most of the royal duties in Prince Edward Island. The direct participation of the royal and viceroyal figures in any of these areas of governance is limited; in practice, their use of the executive powers is directed by the Executive Council, a committee of ministers of the Crown responsible to the unicameral, elected Legislative Assembly and chosen and headed by the Premier of Prince Edward Island (presently Wade MacLauchlan), the head of government. To ensure the stability of government, the lieutenant governor will usually appoint as premier the person who is the current leader of the political party that can obtain the confidence of a plurality in the Legislative Assembly. The leader of the party with the second-most seats usually becomes the Leader of Her Majesty's Loyal Opposition (presently Jamie Fox) and is part of an adversarial parliamentary system intended to keep the government in check. Each of the 27 Members of the Legislative Assembly (MLA) is elected by simple plurality in an electoral district. General elections are called by the lieutenant governor on the first Monday in October four years after the previous election, or may be called, on the advice of the premier, should the government lose a confidence vote in the legislature. Traditionally, politics in the province have been dominated by both the Liberal Party and the Progressive Conservative Party. The Mi'kmaq Confederacy of PEI is the tribal council and provincial territorial organization in the province that represents both the Lennox Island and Abegweit First Nations. Prince Edward Island's transportation network has traditionally revolved around its seaports of Charlottetown, Summerside, Borden, Georgetown, and Souris —linked to its railway system, and the two main airports in Charlottetown and Summerside, for communication with mainland North America. The railway system was abandoned by CN in 1989 in favour of an agreement with the federal government to improve major highways. Until 1997, the province was linked by two passenger-vehicle ferry services to the mainland: one, provided by Marine Atlantic, operated year-round between Borden and Cape Tormentine, New Brunswick; the other, provided by Northumberland Ferries Limited, operates seasonally between Wood Islands and Caribou, Nova Scotia. A third ferry service provided by CTMA operates all year round with seasonal times between Souris and Cap-aux-Meules, Quebec, in the Magdalen Islands. On June 1, 1997, the Confederation Bridge opened, connecting Borden-Carleton to Cape Jourimain, New Brunswick. The world's longest bridge over ice-covered waters, it replaced the Marine Atlantic ferry service. Since then, the Confederation Bridge's assured transportation link to the mainland has altered the province's tourism and agricultural and fisheries export economies. Several airlines service the Charlottetown Airport (CYYG); the Summerside Airport (CYSU) is an additional option for general aviation. The Island has the highest concentration of roadways in Canada. The provincially managed portion of the network consists of 3,824 kilometres (2,376 mi) of paved roadways and 1,558 kilometres (968 mi) of non-paved or clay roads. The province has very strict laws regarding use of road-side signs. Billboards and the use of portable signs are banned. There are standard direction information signs on roads in the province for various businesses and attractions in the immediate area. Some municipalities' by-laws also restrict the types of permanent signs that may be installed on private property. There is an extensive bicycling / hiking trail that spans the island. The Confederation Trail is a 470 kilometres (290 mi) recreational trail system. The land was once owned and used by Canadian National Railway (CN) as a rail line on the island. Prince Edward Island is home to one university, the University of Prince Edward Island (UPEI), located in the city of Charlottetown. The university was created by the Island legislature to replace Prince of Wales College and St. Dunstan's University. UPEI is also home to the Atlantic Veterinary College, which offers the region's only veterinary medicine program. Holland College is the provincial community college, with campuses across the province, including specialised facilities such as the Atlantic Police Academy, Marine Training Centre, and the Culinary Institute of Canada. Prince Edward Island is also home to Maritime Christian College. It is also home to Immanuel Christian School, a private Christian School in Charlottetown. Prince Edward Island's public school system has an English school district named the English Language School Board, as well as a Francophone district, the Commission scolaire de langue française. The English language districts have a total of 10 secondary schools and 54 intermediate and elementary schools while the Francophone district has 6 schools covering all grades. 22 per cent of the student population is enrolled in French immersion. This is one of the highest levels in the country. Today 23.5 per cent of residents aged 15 to 19 have bilingual skills, an increase of 100 per cent in a decade. Prince Edward Island, along with most rural regions in North America, is experiencing an accelerated rate of youth emigration. The provincial government has projected that public school enrollment will decline by 40% during the 2010s. The province has a single health administrative region (or district health authority) called Health PEI. Health PEI receives funding for its operations and is regulated by the Department of Health and Wellness. Many PEI homes and businesses are serviced by central sewage collection and/or treatment systems. These are operated either by a municipality or a private utility. Many industrial operations have their own wastewater treatment facilities. Staff members with the Department of Environment, Labour and Justice provide advice to operators, as needed, on proper system maintenance. The IRAC regulates municipal water and sewer in the province, now under the Environmental Protection Act. Since around 1900, the residents of the City of Charlottetown have benefited from a central sanitary sewer service. Early disposal practices, while advanced for their time, eventually were found to compromise the ecological integrity of the nearby Hillsborough River and the Charlottetown Harbour. By 1974, the Commission had spearheaded the development of a primary wastewater treatment plant, known as the Charlottetown Pollution Control Plant, together with the construction of several pumping stations along the City’s waterfront, and outfall piping deep into the Hillsborough River. There are eight hospitals in the province. Prince Edward Island offers programs and services in areas such as acute care, primary care, home care, palliative care, public health, chronic disease prevention, and mental health and addictions, to name a few. The provincial government has opened several family health centres in recent years in various rural and urban communities. A provincial cancer treatment centre at the Queen Elizabeth Hospital provides support to those dealing with various types of cancer-related illnesses. A family medicine residency program was established in 2009 with the Dalhousie University Faculty of Medicine as a means to encourage new physicians to work in Prince Edward Island. Long-term-care services are also available with several programs in place to support seniors wishing to remain independent in their communities. Many medications for seniors are subsidized through a provincial pharmaceutical plan, however, Prince Edward Island remains one of the only provinces lacking a catastrophic drug coverage program for its residents. The provincial government has several programs for early illness detection, including mammography and pap screening clinics. There are also asthma education and diabetes education programs, as well as prenatal programs, immunization programs and dental health risk prevention programs for children. The government is also attempting to implement a comprehensive integrated Electronic Health Record system. The provincial government has recently committed to enhancing primary care and home care services and has invested in health care facilities in recent capital budgets; mostly replacements and upgrades to provincial government operated nursing homes and hospitals. Some specialist services require patients to be referred to clinics and specialists in neighbouring provinces. Specialist operations and treatments are also provided at larger tertiary referral hospitals in neighbouring provinces such as the IWK Health Centre and Queen Elizabeth II Health Sciences Centre in Nova Scotia or the Saint John Regional Hospital, Moncton Hospital, and Dr. Georges-L.-Dumont University Hospital Centre in New Brunswick. Ground ambulance service in Prince Edward Island is provided under contract by Island EMS. Air ambulance service is provided under contract by LifeFlight. In recent decades, Prince Edward Island's population has shown statistically significant and abnormally high rates of diagnosed rare cancers, particularly in rural areas. Health officials, ecologists and environmental activists point to the use of pesticides for industrial potato farming as a primary contaminant. Prince Edward Island is the only province in Canada that does not provide abortion services through its hospitals. The last abortion was performed in the province in 1982 prior to the opening of the Queen Elizabeth Hospital which saw the closure of the Roman Catholic-affiliated Charlottetown Hospital and the non-denominational Prince Edward Island Hospital; a condition of the "merger" being that abortions not be performed in the province. In 1988, following the court decision R. v. Morgentaler, the then-opposition Progressive Conservative Party of Prince Edward Island tabled a motion demanding that the ban on abortions be upheld at the province's hospitals; the then-governing Prince Edward Island Liberal Party under Premier Joe Ghiz acquiesced and the ban was upheld. The Government of Prince Edward Island will fund abortions for women who travel to another province. Women from Prince Edward Island may also travel to the nearest private user-pay clinic, where they must pay for the procedure using their own funds. Formerly this was the Morgentaler Clinic in Fredericton, New Brunswick until this clinic closed due to lack of funds in July 2014. The clinic was reopened under new ownership in 2016 as Clinic 554 with expanded services. During that gap, women had to travel to Halifax or further. In 2016, the Liberal government led by Premier Wade MacLauchlan announced they would open a women's reproductive health clinic to provide abortions within the province. The island's cultural traditions of art, music and creative writing are supported through the public education system. There is an annual arts festival, the Charlottetown Festival, hosted at the Confederation Centre of the Arts. Lucy Maud Montgomery, who was born in Clifton (now New London) in 1874, wrote some 20 novels and numerous short stories that have been collected into anthologies. Her first Anne book Anne of Green Gables was published in 1908. The musical play Anne of Green Gables has run every year at the Charlottetown festival for more than four decades. The sequel, Anne & Gilbert, premiered in the Playhouse in Victoria in 2005. The actual location of Green Gables, the house featured in Montgomery's Anne books, is in Cavendish, on the north shore of PEI. Elmer Blaney Harris founded an artists colony at Fortune Bridge and set his famous play Johnny Belinda on the island. Robert Harris was a well-known artist. Prince Edward Island's documented music history begins in the 19th century with religious music, some written by the local pump and block maker and organ-importer, Watson Duchemin. Several big bands including the Sons of Temperance Band and the Charlottetown Brass Band were active. Today, Acadian, Celtic, folk, and rock music prevail, with exponents including Gene MacLellan, his daughter Catherine MacLellan, Al Tuck, Lennie Gallant, Two Hours Traffic and Paper Lions. The celebrated singer-songwriter Stompin' Tom Connors spent his formative years in Skinners Pond. Celtic music is certainly the most common traditional music on the island, with fiddling and step dancing being very common. This tradition, largely Scottish, Irish and Acadian in origin is very similar to the music of Cape Breton and to a lesser extent, Newfoundland and is unique to the region. Due to the Islands influence as a former Highlander Clans Scottish colony, a March 4/4 for bagpipes was composed in honour of Prince Edward Island. There is also an annual jazz festival, the P.E.I. Jazz and Blues Festival. There is an annual arts festival, the Charlottetown Festival, hosted at the Confederation Centre of the Arts as well as the Island Fringe Festival that takes place around Charlottetown. An annual jazz festival, the P.E.I. Jazz and Blues Festival. is a one-week-long series of concerts taking place at several venues including Murphy's Community Center, outdoor stages, and churches in Charlottetown. The moving of its date to mid August caused in 2011 a serious loss in funding from Ottawa's regional development agency ACOA. The musician's line up in 2011 included Oliver Jones, Sophie Milman, Matt Dusk, Jack de Keyzer, Jack Semple, Meaghan Smith, Meaghan Blanchard, Hupman Brothers, Alex Dean, Charlie A'Court, Sean Ferris, Jimmy Bowskill, West End Blues Band, Bad Habits, Brian McConnell and Mellotones. There is also Canada Rocks, and the Cavendish Beach Music Festival. With agriculture and fishery playing a large role in the economy, P.E.I. has been marketed as a food tourism destination. Several food festivals have become popular such as the Fall Flavours festival and the Shellfish Festival. Water sports are very popular on Prince Edward Island during the summer, perhaps because the Gulf of St. Lawrence and the Northumberland Strait are warmer than the Atlantic Ocean off the shores of nearby New England. In 1991, Prince Edward Island hosted the Canada Winter Games. In 2009, Prince Edward Island hosted the Canada Summer Games. The Charlottetown Islanders play in the Quebec Major Junior Hockey League. The Island Storm play in the National Basketball League of Canada. The Summerside Western Capitals play in the Maritime Junior A Hockey League. In 2008 and 2009, Prince Edward Island hosted the Tour de PEI, a province-wide cycling race consisting of women from around the world. The most common sports played on the Island are hockey, curling, golf, horse racing, baseball, soccer, rugby, football and basketball. Hainan Province, China, has been the sister province of Prince Edward Island since 2001. This came about after Vice-Governor Lin Fanglue stayed for two days to hold discussions about partnership opportunities and trade.